Wings in Wonderland: My heart is yours! Hello, well today is my second wedding anniversary so I thought I would share a layout I made to mark the occasion. 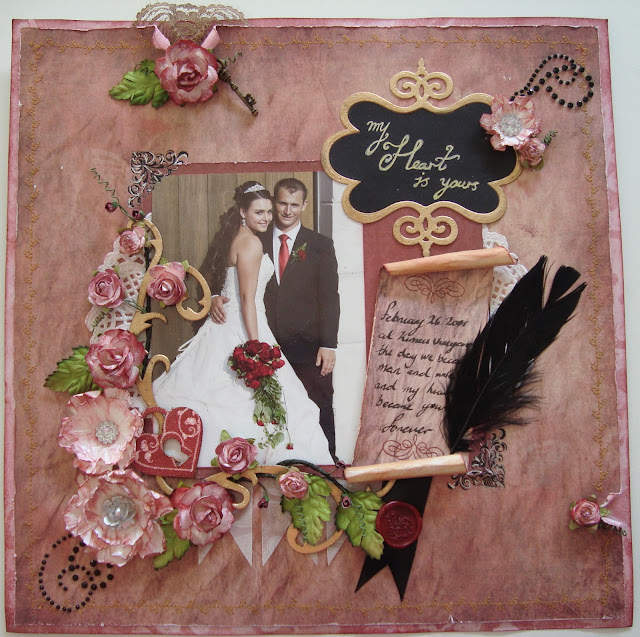 I created this layout based on the sketch for ScrapbookDreams February challenge and added a photo of my husband and I after the "I DO", so take a look. I loved the way the flowers came out below. I made the vine with a mix of Iamroses and Prima flowers that I glimmer misted. The large flowers I made from circles of parchment paper inked up with Tim Holtz Distress ink in Victorian Velvet, these flowers were inspired by Gabrielle Pollacco's tutorial. Go check out her site, she is just amazing and has some wonderful videos on making handmade flowers. I machine stitched around the paper and used gold embossing power on the chipboard pieces cut with Tim Holtz Elegant flourishes dies. I also added some Prima bling and canvas pieces sprayed with Perfect Pearls mists in forever red and cut the main title and frame out using Spellbinders Shapeabilities - Twisted Meal Tags and Accents. The last detail I want to mention is the wax seal on the scroll, this is actually the same wax stick and stamp I used on my wedding invitations and so is the vellum used in the pennants so I thought it was a cute little personal touch. Well that's it I hope you like it! Please let me know if you have any questions.